This patient presented with common issues. Notice how the skin on her face has fallen due to a reduction in the fat pads on her cheeks that we have in our youth. This has formed creases in the skin. Also, years of sun damage cause a detrimental effect on the skins texture and quality. This is the patient post Erbium laser resurfacing. To compliment this procedure, the patient also underwent a Suture Lift and Neck Liposuction. 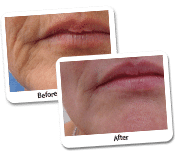 The combination of these procedures has improved the texture and appearance of the skin. Laser resurfacing began in 1994. Dr Lanzer was part of the first group of Dermatologists to buy the first laser resurfacing ultra pulse CO2 laser. Since then, laser resurfacing has progressed. with the main introduction of computer pattern generated laser, which gives a smooth and even delivery of the laser. Dr Lanzer utilises the contour Erbium laser because it produces less heat and the risk of pigmentation is minimised. All procedure have risk, as a result, Dr Lanzer and his staff will give both verbal and detailed explanation of what will be involved with all surgical treatments. Dr Lanzer is dedicated to providing the highest standard of care to his patients. To ensure these standards are upheld to the optimum level of quality, we are both ISO accredited and accredited with the new National Safety and Quality in Health Service standards. In January 2013, 10 new health standards (National Safety and Quality in Health Service (NSQHS) standards) were introduced. Their aim is to provide a nationally consistent statement about the level of care consumers can expect from health services, focussing on improving patient safety and quality of care. There are 10 standards which each have numerous items which must be met to 100% compliance before accreditation can be granted. The 10 standards include: Clinical Governance, Consumer participation, Infection Control, Medication safety, Patient identification, Clinical handover, Blood products, Pressure injury prevention, Clinical deterioration and Falls prevention. Health services undergoing a full review were required to address all 10 standards this year. Dr Lanzer and his staff put hundreds of hours in to ensuring our practice was 100% compliant. We looked at every area of everything we do here and analysed the following; how safely it is done, how our patients benefit, how our staff benefit, how it can be done better, how we analyse it and how we review it. Across July and August 2013 we underwent a full accreditation review, having two auditors come in and assess our practice against both the ISO 9001:2008 and all 10 NSQHS standards. The auditors were very pleased with our commitment to improving patient safety and quality of service. Policies and practices have a direct patient impact on patient safety and care such as; screening techniques for at risk patients, standardised medication recording to lower the risk to patients, full review of infection control procedures and staff training. We are pleased to announce we have been awarded a full 3 year accreditation status in both standards. 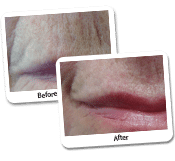 Laser resurfacing is one of the options available to obtain a more youthful appearance. 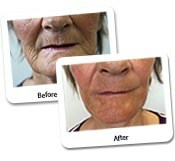 The procedure can be executed on numerous parts of the body, which includes the face, as seen in this case study. Even though the patient in this case study also had a suture lift and neck liposuction, the combination of these procedures with the laser resurfacing treatment has provided the patient with an amazing result. 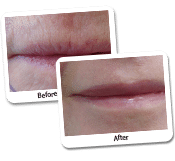 Laser resurfacing is also available as an individual treatment and the results that could be obtained from such a procedure can be seen on other case studies published on the website. There are many case studies available on the Dr Lanzer website that show results obtained through laser resurfacing. Despite numerous case studies displaying the benefit of this procedure, we must mention that results are unique for every patient, because every patient is unique. Therefore, cosmetic surgeons can only provide you with a prediction of the results before the procedure takes place and can never provide any guarantees. At the Dr Lanzer Clinic, we aim to provide every patient with a comprehensible treatment plan; this includes more information about your treatment, the cost and the aftercare involved. It is important to read through this information before the procedure takes place, since this enables you to ask your surgeon any questions you may have before you get your treatment. 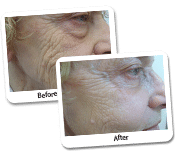 View more Laser Resurfacing Before And After photos above.